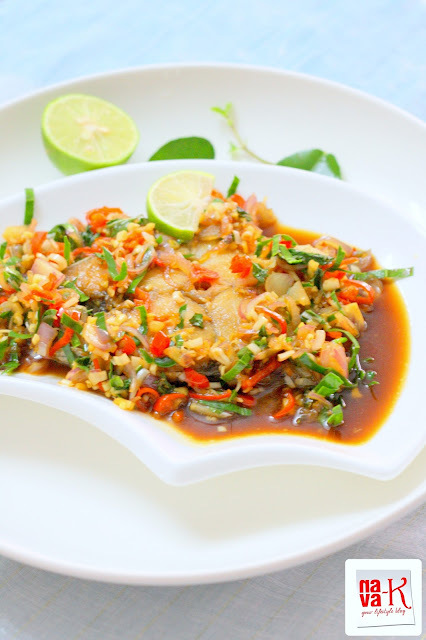 Thai Crispy Fish. Thai again and fish again? Well, what can I say? Thai food forever a tremendous food killer in my house and fish of course, oh-god, do I have to repeat myself again? I think you know it (Thai Steamed Fish, Teochew Steamed Fish, Hong Kong Style Steamed Cod Fish, Steamed White Pompret & Chilli Lime Fish). Obviously too, Thai cuisine is not something new for me. I sort of have not only belted the essential Thai cooking technics, but also the required Thai ingredients for the splattering and profound tastes (Tom Yam Goong, Tom Kha Ghai, Spicy Thai Noodles, Thai Fish Noodle Soup, Thai Vegetable Curry & Shrimp Pad Thai Salad). This Thai Crispy Fish? Another, the other style to how a Thai fish dish should be? 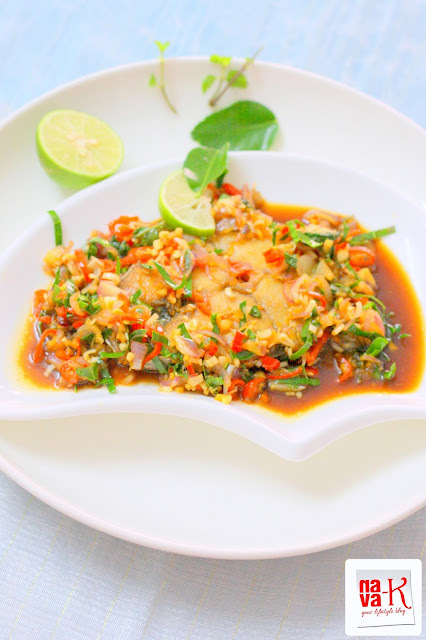 Sauce made from the quintessential Thai ingredients like lemongrass, kaffir lime leaves, lime juice, fish sauce and soy sauce, tipped over crispy fried threadfin/ikan kurau fish (Crispy Chilli Fish). Rub ginger and salt over the fish. Deep fry fish, dish out and place on a plate. Sauté shallots, ginger, lemongrass and chili. Pour in soy sauce and fish sauce; add salt (if needed), sugar, lime juice and 3-4 tbsp of water. Let it simmer and drop in mint and lime leaves. Stir and pour sauce atop fish. wow it looks so colorful.. so tempting and delicious..
Nava, I don't think think your passion will dry up. I guess some days (to take the words from a song) are diamonds and some days are stones! But I love going through your pictures and your recipes. If I had a hard day at work I doubt I'd be even inspired to post!! this looks so colorful... i agree to u on meetings... sometimes, i prefer to call it as chair-warming sessions!!! Have a great week ahead. Regards. Hey Nava, your fish is always good after a tiring meeting. I am hungry for some thai food now. the fish looks so delicious with the sauce poured in. Oh My, looks gourmet styled and cooked to perfection. I love the herbs all over the saucy fish!! Nice clicks! Mackerel = full of omega 3! Your picture makes me wanna become non-vegetarian for sure and kinda kicks in the thought of what all I'm missing!! I could feel the flavor and the crispiness of the fish.lovely clicks. Like you i really hate meeting.people get so argumentative & all the focus is lost. Storing has become a necessity if u r working. I love thai food and ur preparation looks very tempting ! A few weeks ago I tried lemongrass in rice and loved its flavor now its time to use it in fish or chicken. 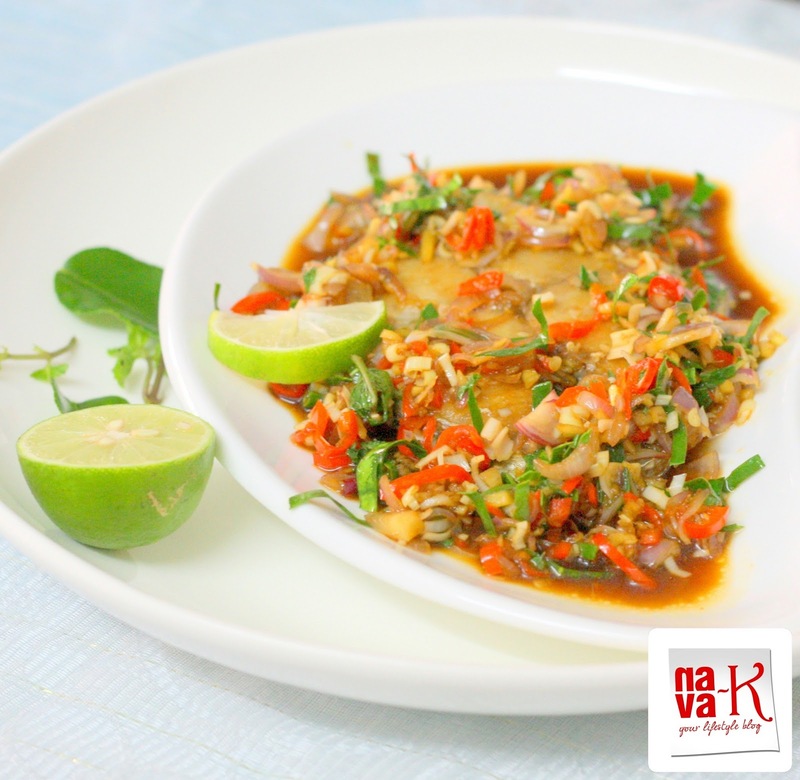 Your recipe for the thai style fish with a simple sauce makes it an incredibly delicious, quick and healthy meal. Hey this looks lovely..and i loved your bowl, nice shape.. Very delicious. Will try this one day. I wish I could have a bowl now yum. I love Thai. I love fish and this looks so delicious. Bookmarked!